A sea-change on climate sensitivity at The Economist | Watts Up With That? People send me stuff, today it was this “editors picks” from John Micklethwait, editor of The Economist. After years of being pro-warming, I was shocked to see this headline as a “pick”. It seems a change in editorial position may be afoot. This also means the case for saying the climate is less sensitive to CO₂ emissions than previously believed cannot rest on models alone. There must be other explanations—and, as it happens, there are: individual climatic influences and feedback loops that amplify (and sometimes moderate) climate change. That last paragraph meshes very well with recent publications about lower climate sensitivity, which they reference. It even cites a paper that I’ve recently had accepted for publication, and which I think will at least get a mention in AR5 WG1. h/t to Nic Lewis and Dr. Roger Pielke Sr. I think what this means is: Quick, we’ve gotta get those carbon taxes enacted really really fast before people realize what’s up and we lose that juicy source of confiscatory revenue we can milk right out of them. Most of that 1 degree was built in by creative adjustments and corrections and homogenizations to the surface temperature data. The other half of the degree could very well be due to the trend of putting temperature probes nearer to buildings when they went with MMTS and electric sensors. That was a real trend, which was given short shrift by the data correctors. Woho! I stopped buying The Economist because of their daft adherence to the Warmista dogma, indicating a lack of intellectual rigour, that possibly may afflict all their writings. This is a good start to renewing my relationship with the Economist. New Scientist has a much longer row to hoe though. Oh, I say and I say it again, ya been had! Ya been took! Ya been hoodwinked! Bamboozled! Led astray! Run amok! It might have something to do with the fact that the lights are about to go out in Britain. well yeah, cold is the new warm. The rats are jumping off the ship as she sinks lower and lower. Pass the popcorn. Maybe they should start by trying to predict today correctly. What is lacking is more clarity on the underlying reasons for IPCC AR4 oversensitivity. Those have been explained in the penultimate chapter of my second book, alternatively by Bob Tisdale, and again alternatively by Lindzen (and possible Spencer). Following Lord Keynes, once you change your mind your need to rethink the basics. And I had such dreams of owning ocean front property here in Alberta, Canada. Now, the Economist had wrecked my planned advertizing blitz. Kudos to them for stepping up to the plate. Perhaps more significant they forwarded their article your way, or some one did. The stitching in Hanson’s, Santer’s and Mann’s garments are beginning to unravel. Before long everyone except themselves will be able to see them for what they are. Movement in the right direction, but they “chickened out” in the final two paragraphs. The Economist still cannot bring themselves into seriously considering a sensitivity below 2 as a possibility. Around 30% of the world is cooling according to BEST (but with caveats) This includes countries with some very good historic figures-Britain. This is as distinct to those countries whose figures should be taken with a large pinch of salt. Here are the Met office figures for Central England-the oldest such record in the world. Look at the right hand side of the graph. Either we are having another dramatic temperature retreat in the UK or it will be shown to be merely a blip in the centuries long upwards trend-who knows? Now 12 years is not an official trend but it sure is interesting, and the return of the cold has had an enormous impact on our heating bills and on our farming practices. Not 15 miles from the Met Office a farmer on Upland Dartmoor has replaced their traditional Dartmoor stock with hardier Welsh cattle as the native stock have not coped well the last five years. Nor has the human stock. Temperatures have been plunging as rapidly as energy prices have been escalating as successive govts nonsensical energy policies come home to roost. What is or isn’t happening with the assumed Co2/temperature correlation isn’t some academic exercise whereby climate scientists can advance alternative theories whilst the Economist observes from the sidelines. Unless we believe that an extraordinary warming co2 bubble existed over the UK for a dozen or so years in the 1990’s which has now drifted away, surely the obvious must be faced. That is that the 1990’s were a manifestation of the long established rising temperature trend caused by natural variability. The sharp decline in the last decade is also natural variability. We can’t predicate an insane energy policy on the notion that we must curtail co2 at any costs-including shutting down perfectly good power stations during a time of sharply declining temperatures and energy scarcity. We must predicate it on what is surely becomingly increasingly obvious-our climate is very variable naturally due to the weather extremes that constantly punctuate it. This shift towards admitting absence of global warming, or the slowing down of global warming, and bringing discussion to the general public must be driving those alarmists totally bonkers! They clearly missed the Marcott paper…/sarc. Should the quotation be attributed to Keynes rather than Keyes! Let’s see. CO2 is rising sharply, temps are flat. And as per the video link above there is NO demonstrated causal correlation between CO2 & climate temperature. Maybe what it means is that CO2 is a dud, as is obvious from the video link above! And maybe the only reason that everyone seems all puzzled by the lack of warming is because of media hype and that 90%+ of the people haven’t got the message on CO2 that is presented in the video (so share it and spread the word about it). This is remarkably sober and well balance. Full credit to the Economist. Their editorial policy wins though when topic get highly emotive (e.g., the build-up to the invasion of Iraq). Correction: I am a big fan of John Maynard Keynes. it at least is a good start in the right direction. Like Robert of Ottowa I had binned my subscription to the Economist some years ago. I had become disgusted with their slavish adherence to warmist dogma. This is promising if it is not an anomaly that will quickly be “corrected”. Indeed. It’s good to hear it, thanks. The agenda of these jerks was wealth redistribution. They don’t care about “Mother Earth”. So expect a lot more of this hunt for credibility from degenerate editors trying to “be reasonable” They want to get back to the wealth redistribution scheme and they will toss “Climate Change” under the bus to do so. This isn’t a sea change, This is the same ole, same ole. They are just trying to peel away from Watts, Ball, Monckton, et al and the only way to do so is to “be reasonable” about observed climate data. They will be back to empty our pockets. This is at best a stall tactic, at worst a Machiavellian move. Seems like the first few cautious steps in the start of a climb down but that last step can be a doozy! stopped buying the Economist years ago after their alarmist garbage was printed as fact…. not going to buy again anytime soon…..
Time for a polite note discussing the reality, the magnitude, and the scope of the Little Ice Age. Anecdote is not the singular form of data, and things like the frozen Thames aren’t “scientific measurements of temperature”. But they do highlight that the actual problematic portion of The Hockey Stick is -not- the grafted-on instruments (which, at least, have the virtue of being instruments! ), but instead the shaft of the stick rewriting history. Most journalism was and still is about fear mongering. That is what attracts eyeballs to the advertising, which is their business model. When the AGW thingy was pushed by our media savvy Greenies, they tailor made it for journalists to have a new and easy fearmongering topic. . . . Just reprint the EcoGreenie Press releases and viola! Job done. Same logic for the politicians . . . The greenies lined up a parade of fearful citizens and politicians jumped on the AGW bandwagon and realized that leading this parade got them reelected. And the of course we have the scientists who saw a Fame and Gravy train roll into the station and quickly realized they could keep their careers on the easy track as long as the fearmongering “science basis” of the scare was validated by their peer/pal reviewed papers. But every Great Sky is Falling grift comes to and end and the players start looking around for the Next Great Thingy to Scare the Folks with. That is what the Econmist is doing. Life goes on. 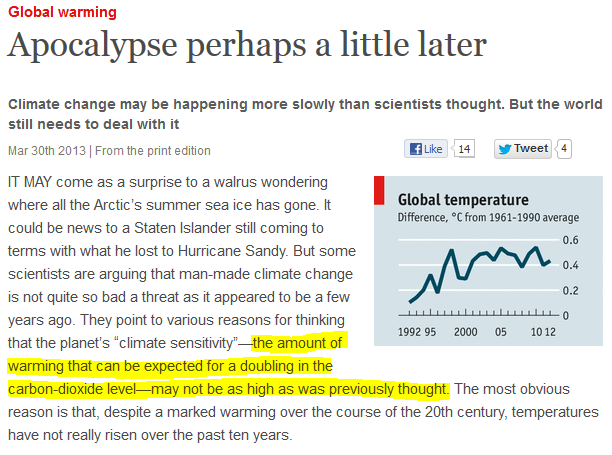 I wish somebody would tell The Economist that the one-degree rise they quote is due to fiddling of the historic record. One example of across-the-board tweaking is at Iceland’s Teigarhorn station. The Jan 1900 temp was showing 0.7C two years ago, -0.2C last year, and is now showing -0.4C. I wonder if Mr. Hanson is aware of the cooling past? The Economist? 78% of its readers read it while sitting on the toilet. The agenda of these jerks was wealth redistribution….. Given the Cyprus financial mess. (The Russian oligarchy who were the target of the haircut managed to spirit away their deposits via branch banks including one in the UK. info from 2 days ago and today ) I imagine the economic types really want to use anything as a diversion. Two things about this article. The Economist does not give the author of it. Why ?? It would be interesting to know. Secondly it is interesting to read the comments on it in the Economists. Hardly any religiously defending AGW. Most are similar, in tone at least, to those above. I do have the feeling that the tide is turning, but you can be sure that a new global threat scam will eventually emerge to replace it. Global scamming schemes are hugely profitable for those behind them. I’m really good at multiple choice questions, but this one leaves me stumped. Too bad that Keynes didn’t change more of his conclusions, since the facts were rarely on his side. This quotation of his has to be the most ironic of all time. The Economist just went socialist with its part owner, The FT, along with their parent company Pearson (Which sells a lot to the Public Sector). Normal Self-interest at work. Don’t forget the “Scientific” American. They had NO good reason to sell out to the AGW nonsense. Somewhere lurking in the AGW undergrowth is the UK’s New “Scientist”. My subscriptions to all these august journals lapsed as their content became less rational. I wonder what social policy this increasing body of research is suggesting will be profoundly signified? We need CG3 contents. Now, please. Technically, only 1 model from IPCC AR4 is below Hadcrut3 (as of January, 2013). When February’s lower number for Hadcrut3 comes out, the spread of ALL 23 models will be higher than Hadcrut3. Zoom-in of the average of all 23 models versus Hadcrut3. That has been their policy for all articles forever. The Met Office issued a cold weather alert for much of England, with a 100% probability of severe cold weather and ice until Friday. Its outlook for Sunday until Tuesday 9 April predicts cold, dry weather, with a few light snow flurries and widespread frost and icy patches overnight. And it warned that temperatures are unlikely to recover to closer to normal levels until the latter part of April. In western Scotland, thousands endured a sixth day without power after being cut off last week, and across the UK many transport routes remained impassable because of deep snow drifts. RossP says (March 27, 2013 at 4:59 pm) : The Economist does not give the author of it. Why ?? There is hardly ever any attribution in the Economist. I hope the banksters who read the Economist will have second thoughts about their ‘global warming’ investments. As I said in a comment (lost at the bottom but with most ‘likes’) the banks are the ultimate contrarian indicator. If they want to lose our money all over again by hurling money at CAGW, so be it. The rest of us can laugh all the way to, er, any country that doesn’t steal our money to fund bank bailouts. You do seem to have missed one crucial element, the numerous papers which present a lag between temperature and CO2, showing it as an effect and not a cause. There have been three in the past few months alone and even Al Gore’s graph could be seen to do so when enlarged closely enough, which challenges the effect of CO2 on temperatures altogether. 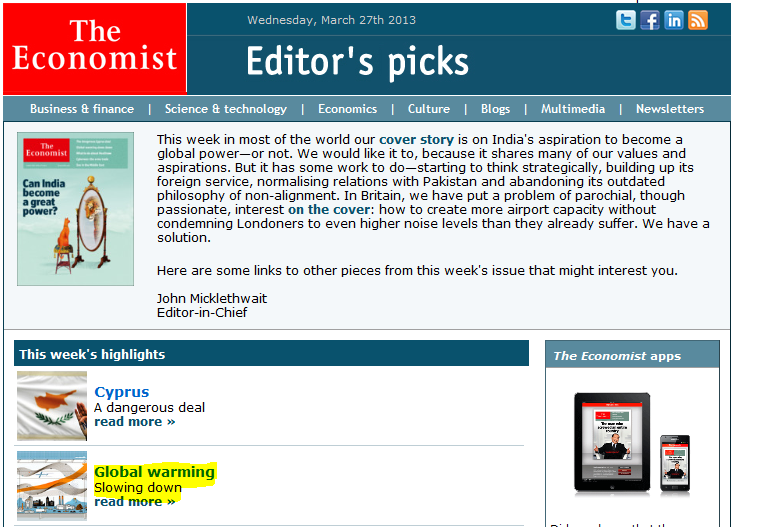 The Economist was and is as bad informed about South Asia- where I live – as about Climate Change. Did they see the economic crisis coming a few years back? Not much of a fact based publication, more of a policy pusher in disguise. so, this is typical damage control mode. Try to pose as ‘reasonable’ while actually not conceding anything. People, don’t delude yourselves, those jerks are never gonna change. Technically, only 1 model from IPCC AR4 is below Hadcrut3 (as of January, 2013). Ask enough monkeys the answer to 1+1 and occasionally you will get 2 as the answer. might as well predict climate with a dart board or pair of dice. just as accurate and a whole lot cheaper and quicker. while it takes millions of dollars and years of programming to get the wrong answer with a super duper climate computer, a pair of dice can deliver the same accuracy in seconds. take a look at any place on the earth where people live. 1/3 chance it will be warmer next year, 1/3 chance it will be cooler, and 1/3 chance it will remain the same. my dog can predict climate as well as the climate models by how fast he wags his tail. This will be the next line of retreat: DAGW is in remission but the patient still won’t recover. It’s sure to come back! The last 15 years are just a hiatus or pause in an inexorable long-term warming trend. See page 7 of this document. According to Hansen, we are supposed to be a full 1.25 degC above the thirty year mean instead of hovering around + .2 degC. To cover up this colossal train wreck, hack sites like climateskeptics.com used Hansen’s “best case scenario” GISSC and claimed it was his forecast today, when in reality version A and B are what he forecasted. The version they tried to claim was his forecast was based upon a drastic cut in CO2 emissions that never occurred. The order of the day by these clowns continues to be cover-up and deceit so that politicians can use the lies to tax and regulate. …..The rest of us can laugh all the way to, er, any country that doesn’t steal our money to fund bank bailouts. If you find one let me know, I want to retire…. it was all clear: The climate was warming…leads to weather warming. If I was The Economist editor, I would have been getting rather concerned that the glaring disparity, between my ‘scientific’ opinion and the freezing discomfort of my readers as they commute their way to work through the miserable English gloom, might start to impact on the publication’s sales. The Economist’s professed stock in trade is its ‘authority’, on all subjects, but it has been starting to look a little bit silly on this one. Personally, I found that very little of its content actually turned out to be authoritative about events in which I was actually involved, and so I eventually gave up my subscription, because I didn’t believe them any more. And in this case, everybody is actually involved in the events, most notably their UK readership, who will be starting to think: “This global warming-barbecue summer-never see snow again business is crap..”, as they ruin their shoes, trudging through the filthy grey sludge of Urban English snow, to sit in a freezing waiting room on a station where their train has been cancelled by ice on the conductor rail. You can only play King Canute for so long. This article has gone viral. I’m now having simultaneous arguments with alarmists on 3 blogs, and it’s 2am in the UK and bloody freezing! Sorry I got the site wrong that promotes hack science in my post above.. It is skepticalscience.com NOT climateskeptics. Skepticalscience.com is run by John Cook and has been caught using deceptive tactics to distort climate data. The agenda of these jerks was wealth redistribution…”.. Thanks for the mention that the Rothschild’s are owners of the Economists. In the USA it is the JP Morgan clan who owns the media not that it matters since they are all interconnected. Checkout Chiefio’s blog on the Cyprus situation. The Economist disappoints. – gavin. According to the graph shown, they will be outside the models’ range in a few weeks or months not a few years. This is a step in the right direction. I,m hoping that between this year and the next that President Obama will have to show a change in his tune on climate change. Global average temperature, as imagined by the Met Office, is already below the lowest Hansen scenario, which assumed no increase in CO2 concentration after AD 2000. Carbon dioxide, as imagined by NASA, has puffed ever higher, so Hansen, NASA GISS (as adjusted, ie cooked), NOAA, HadCru & company chalk up one massive FAIL. It seems that a dam has broken and everyone is talking about natural variability and natural regularities. Not long ago Trenberth denied the very relevance of the same when he called for a reversal of the Null Hypothesis. The breaking of this dam is the end of “the consensus” in what has passed for climate science. To become a genuine science, climate science must account for natural variability and it must take as it primary goal the description of natural regularities. That description will be in the form of hypotheses, universally quantified general statements, that are well confirmed in experience. Claims about “global warming/climate change” take on significance only when presented against the background of an empirical science that comprehends natural variability. Enough talk of temperatures flattening out. That’s only the best the data tinkerers can do, to hide the decline, and it is still not so. Just ask anybody in England this year, or Queensland last year, if temps have leveled off The hell they have, and the fall in tyhem is accelerating.. Die Welt in Germany and Jyllandsposten in Denmark has also featured sceptical articles lately. Reason is finally winning. A little while ago there was a similar moment in the Cholesterol theory. Business Week published an article summarizing the contradictions in the evidence, and in particular pointed out that adding cholesterol lowering compounds to statins actually raised death and morbidity rates. This was really a clear sign that it had now arrived in the mainstream media that the world was more complicated than we had thought. This is is a similar moment in climate. Well I would say the Bilderberger steering committee has declared the CO2AGW media campaign over. Probably they need their journalists now to try to distract the EU slaves from the Euro-omnishambles. They have reached their goals anyway through the subsidy pumping wind turbines and solar panels. Now, throw the useful idiot climate scientists to the masses so they can be torn to pieces; as a distraction. The UK has seen a drop of some 0.5degC this century! The UK’s response to temperature changes is dampened since it is a small island surrounded by water and due to the their thermal capacity they dampen the speed of change. The UK temperature anomaly is now broadly what it was in 1940. CET is the most extensive thermometer record. Probably one of the most interesting tasks that could be undertaken is to re-evaluate CET with a view to getting a proper handle on station changes/drop outs and their effect, and on UHI and any temperature distortion brought about by UHI. It would also be a good idea to get a proper handle on error margins. It would be interessing to isolate the best quality rural stations and look at their raw data to see what they say by way of comparator. As a matter of logic, it is impossible to ascertain climate sensitivity until one knows the bounds of natural variation. In order to find cliamte sensitivity, one needs to remove the noise of natural variation, and it is only once that is done that one is left with the signal of climate sensitivity. One of the major goals in climate science ought to be the ascertainment of natural variation and its bounds. What is the basic physics behind a ‘temporary lag’ Has CO2 temporarily lost its mojo as a heat trapping gas? Surely, this line of argument is patently disengenuous. The best case argument for the warmists is that natural variation is presently equal to the CO” forcing, but natural variation is by its nature variable and there will come a time when the opposite forcing of natural varaition subsides and we will then see a return to the upward temperature trend caused by CO2 which will come back with a vengeance once released from the shackles of natural variation. What is the basic physics behind a ‘temporary lag’ Has CO2 temporarily lost its mojo as a heat trapping gas? How, Why? What are the special properties of CO2 that cause such phenomena? This is very significant for the Economist considering some of the past pronouncements in the subject of climate. However, it is not fully joined up. It does not matter how much the average temperature rises. It is the impacts of that rise upon human beings and the rest of nature that should be of concern. There are two factors that are important here. First, is that lower sensitivity will imply a slower rate of temperature rise over time for a given rise in greenhouse gases. Therefore if median sensitivity is halved, so is halved the median expected temperature rise this century. The worst alleged impacts are from destabilization of the climate system as a result of rapid change. The climate tipping points are far less likely to be breached by slower rates of warming. Along with that, it is far easier to adapt to more gradual changes. So 30cm a century of sea level rise is far easier to adapt to that 30cm a decade. Second, is that catastrophic impacts have been over-hyped. The most costly projected impacts have turned out to be founded on little or no substance. The melting of the ice sheets is not accelerating. Crops yields will not fall by 50% in some African countries by 2020. The Amazon will not suddenly collapse from a drop in rainfall. Tropical storms are not getting more frequent or violent. Etc. These two components of slower warming rates and the lower costs from a rise in temperature over time multiply together, to make a dramatically different picture over time. Planet Earth says: “reports of my death have been greatly exaggerated”. Or, as an increasing body of research is suggesting, it may be that the climate is responding to higher concentrations of carbon dioxide BY GETTING COLDER?????????? Well Professor Knutti, what it means to normal people is the consensus of eggsperts don’t have a clue what’s going on and the null hypothesis that the climate is always changing is alive and well. Naturally all those who behaved like shrieking schoolgirls with the vapours over the greatest consensus of chicken littles modern science has ever produced, need to try and extricate themselves with some skerrick of dignity and reputation intact. Now it’s the turn of we holocaust deniers to shriek with laughter at their shenanigans trying desperately to disguise their increasingly frantic rush for the exits. What a hoot. It’s not just the Economist where minds are slowly turning. Over in Germany Notrickszone has been highlighting various media who are beginning to doubt the projections of doom and thermageddon. CAGW is a supertanker and don’t turn on a dime but it will turn as long as the lack of warming (or cooling) continues. Secondly, Warmist orgnaisaitons & climate scientists such as the Met Office and people like Dr. James Hansen are being forced to face reality. As they say the truth will out in the end. While over in the UK we have various media which used to solidly back CAGW beginning to turn more sceptical. Examples are the Daily Mail, Express and I think the Telegraph. These recent pronoucements would have been shocking back in 2005. Actually fellow/fellaw who wrote above about Cyprus banks will even trump all events even global warming. The beurocrats in the EU have probably started the greatest economic depression we will ever experience. Lucky I don’t live in the NH..They simply should have let Cyprus get out of the EU as Greece should have etc . Now they will all probably have to dissolve. Probably Germany will be the first to get out. This small step in my view is a huge leap for the Economist. It has only been since June, 2012, that the cover story was of the Vanishing North, and a 14-page special report on the effects of global warming. This change is a major transformation in a short time. This is purely wishful thinking, but could it only be a few more weeks until The Economist begins attacking those idiots who created such a self-damaging energy policy for Britain? As a rule of thumb, global temperatures rise by about 1.5°C for each trillion tonnes of carbon put into the atmosphere. The world has pumped out half a trillion tonnes of carbon since 1750, and temperatures have risen by 0.8°C. At current rates, the next half-trillion tonnes will be emitted by 2045; the one after that before 2080. I thought there were “diminishing returns” from the addition of CO2. Is this paragraph a blunder? 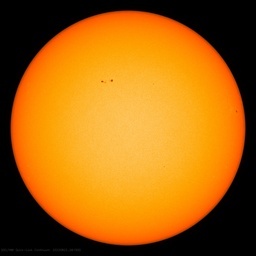 And the sunspot number this afternoon is down to 35. Not that you would notice in London though, because it’s overcas and raining, and the temperature is five degrees Celsius, dropping to minus two tonight. It’s not the scientifically offensive propaganda that would annoy me if I still lived in the UK, nor even the customary wastage of taxpayers money, but the fact that the government has spent ten years promising a change in climate to that of the Costa Del Sol or Mauritius, and yet here I am, still freezing my nuts off on East Croydon station after trudging my way there through a spring blizzard. ““You can go outside and spit and have the same effect as doubling C02′” – Reid Bryson, the ‘Father of climatology’” Doubling CO2 may not have much of an effect on global temperatures but it would have a huge positive effect on all ecosystems since the producers (photo-synthesizers) would have an immediate increase of about 1/3 in biomass production. They don’t even mention the other possibility that CO2 is not the fundamental factor in the short, medium, or long run because it is a trace gas and the multidecadal ocean cycles are far more important to begin with in short and medium run models and observational commentary. Given the 20th century record of periodic 25-30 year flat or falling temperatures around an underlying rise of 0.75C (perhaps 0.4-0.5C allowing for siting distortion), the mystery is why anyone is mystified by the current pause. Would you care to predict a date when you expect warming to resume? This piece was NOT published in the printed journal of The Economist 23-29 March. I have the journal in front of me , I wonder why? Perhaps Anthony could ask the editor-in-chief? The Economist’s account of models is the most sophisticated that has appeared in popular media but it contains a crucial error. What the Economist has right is that GCMs imitate the climate system. In other words, a GCM is an attempt to reproduce, in a computer, the workings of the climate. 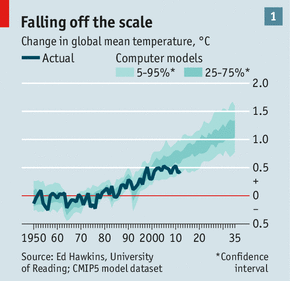 In addition, the Economist is right that the models do not take account of observations. What the Economist has wrong is that the models describe the processes and feedbacks in the climate system. Models do no such thing. Models imitate the processes and feedbacks but do not describe them. If the models described them then modelers could produce from model code the physical hypotheses that describe the relevant natural processes. Modelers cannot produce those physical hypotheses. Modelers create mathematical equations, not physical hypotheses, which take numbers as inputs and produce numbers as outputs. Modelers then interpret the output numbers as the effects of one or another natural process. However, any such work depends on modelers’ intuition and not something that can be shared and tested against reality the way that physical hypotheses can be shared among scientists. The “climate sensitivity” assigned to any model cannot be something different from the modeler’s intuitions about the model. GCMs reproduce reality but do not describe it. Models imitate natural processes but do not describe them. Physical hypotheses describe natural processes but do not imitate or reproduce them. GCMs are not comparable to physical hypotheses. Only physical hypotheses can be confirmed or disconfirmed through experience. These facts are the reason that GCMs do not take account of observations. In principle, GCMs cannot take account of observations. The use of GCMs should be limited to analytic work and they must never be used as substitutes for physical hypotheses. Embarrassing for Climate Scientists of the CO2 warming persuasion, I should think, to have journalists leading them out of the wilderness! When it has become patently obvious to the ordinary folk before the consensus wakes up, the team’s quality of science must be ‘worse that we thought’, ‘unprecedented’ in science. The information didn’t changed, there wasn’t and still there isn’t any information to extract any conclusion. The Economist is just going with the wind, like it went in the past. And they go because they are nothing more than a socialist right magazine. Regardless, something that is unlikely to change is their advocacy for better market based approaches to reducing emissions (ie, a simple carbon tax) instead of cumbersome regulations and trading systems. Obligatory genuflection to the CAGW god don’t you think? … it has the effect on those readers whose hopes lie in line with CAGW in that they aren’t being completely ‘dashed’ or thrown to the wolves.